I recently joined a workshop called Visual storytelling – creating compelling multimedia pieces at NORDphotography on Inderøy in Norway with Bob Sacha as a teacher. The director of NORDphotography, Elisabeth Nordeng Aanes, asked us before the course started what we wanted to make a video about. Since there are many small-scale producers of foods and drinks nearby, I told her that I wanted to go to Gulburet – a combined cattle farm, brewery, farm shop and bakery. Having arrived at 6 a.m. one morning, I was met by the friendly owner of the bakery, Liv Elin Olsen, who had just said goodbye to one of her employees who would bring fresh bakery products to a food fair in the city of Trondheim. Gulburet has got its name because it was painted yellow ages ago and gul in Norwegian means yellow, while bur is short for stabbur, which was used for storing food. 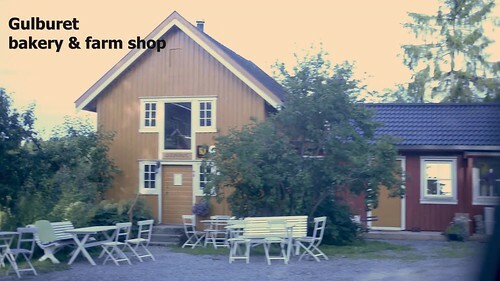 It is located at the Værdal Østre farm where Liv Elin and her husband have about 20 cows, a brewery, a bakery, a farm shop and a cafe. The three last ones face the idyllic courtyard of the farm where the barn is located on the left and the farmhouse on the right, while in the middle, guests at the cafe can enjoy fresh bakery products with tea or coffee in the sun or in the shade of big trees according to their wishes. Inside the farm shop, both Liv Elin’s bakery products and products from many other small-scale producers can be found. Liv Elin told me that although she has been making bakery products for many years, she’s still not a baker, she’s just baking, having never finished an apprenticeship. However, she has been baking for more than 20 years at this farm and served home-made bread to their guests. Since they wanted to buy the bread, she started baking bread in the farmhouse and selling it at Gulburet in 2010, while the bakery next to the farm shop was built in the winter of 2015/2016. Consequently, when customers enter the shop, they are surrounded by pleasant fragrances from the bakery, making them want to stay longer and enjoy dishes like sandwiches, pastries and confectionery from the cafe. Beer made by Liv Elin’s husband Arve and aquavit , a dry Scandinavian liquor flavored with caraway, made at another farm, are also available. When Liv Elin had started preparing dough, she went out to the barn and returned with a bucket of milk from the cows, which had been milked just before. She poured milk with no pasteurisation or homogenisation onto the dough. The bread would be baked at a temperature of about 180C and there were no requirements for any processing of the milk. After the dough had been kneaded and leavened, she weighed certain amounts of dough and formed them into sausage shapes. Next, she put them in a tray filled with water, rolled them in a tray filled with a mixture of flaxseeds, sunflower seeds and sesame seeds and finally put them in bread tins. After leavening, she put the bread tins in an oven and took them out again when they had been baked, filling the bakery with a pleasant fragrance. In fact, she had let wholemeal wheat flour and the seeds be immersed in water since the evening before. This is an old technique, which has apparently been forgotten by most bakers, where the grains and the seeds absorb humidity such that the resulting bread gets more tasty and has a longer shelf life. The next day, she would mix it with broth, finely milled flour, salt, water and yeast, making dough in a kneader. Liv Elin let me know that you have to let the dough know who’s the boss and use a firm grip, treating the dough like a living creature. Actually, baker’s yeast consist of myriads of tiny organisms, which she instead presumably thinks of as one. When she had placed a large clump of dough in a plastic box and put a lid on it, I forgot about it until she said that the dough was in bad mood. In fact, the yeast had increased the volume of the dough so much that the lid had been lifted up and dough was very slowly falling towards the table. It was interesting to watch the dough forming lots of bonds, trying to prevent the dough from falling down. In order to let it get in good mood again, she applied finely milled flour to the dough and kneaded it by hand such that the flour entered the dough and the yeast would have something to eat. She made a bread called Jessenkak where Jessen is the last name of an auctioneer who bought large amounts of the same type of bread and gave them as gifts to family and friends, while kak is a local word for bread. A recipe in Norwegian can be found here. Liv Elin worked as a confectioner too, using a wooden roller to flatten the dough, next she used a spatula to apply a thin layer of chocolate on the top of the dough, folding the dough and flattening it again by means of the wooden roller. Then, cutting it into stripes by means of a roller cutter. Finally, she tied the stripes of dough in knots, forming a flat, figure-of-eight-shape, which is called kringle in Norwegian. Another time, she treated the dough in the same way until she had cut it into stripes. Then, she formed into Danish pastries, instead. As I’ve experienced so many times before, it’s always a great pleasure to enter a bakery where an artisan makes bakery products manually, almost always wth attention to detail and with loving care. Not surprisingly, I once viisted a baker who had forgotten to add salt to his breads and Liv Elin had once forgotten to add sugar to her pastries. The next day she found a note in the farm shop: tired baker equals pastries with no sugar. Liv Elin preferred to use a pun in Norwegian: annsleiskringle instead of aniskringle. After Liv Elin had finished baking aroud noon, I went to the arts shop located a few minutes walk from the bakery where there was a small exhibition of paintings, glassware and textiles, all of it for sale. In the evening, I showed parts of what I had done to Bob, who told me that I needed to film some of Liv Elin’s work from other angles, nearer, further away and so on. I went back the next day, following his advice in order to make as good a visual story as possible. Everyone who’s travelling between Trondheim and Steinkjer are advised to go to Gulburet, enter the farm shop, sense pleasant fragrances from the bakery, buy various dishes in the cafe and sit outside in the garden if the weather permits, alternatively sit inside on the floor above the farm shop. Beer tastings and dinners are occasionally arranged for groups. A special type of dinner is called 905 and 1905, where the last number is the year when Norway got independent and 905 is 1000 years before. Then, guests are served typical dishes from 905 when Scandinavian vikings imported exotic foods from the Levant and from 1905. Both Saga and Gulburet are members of Den gyldne omvei, meaning the Golden detour, where visitors can find accommodation, places to eat, art exhibitions, farm shops and even more.